There is so much about travel that I love. Emma, Kelly, Rebecca host a travel link-up topic every month and this month it is about your favorite things and I have decided to tell you all about my favorite travel things. Of course, I don’t always think about most of these things when I travel, but some I do and some are lying under the surface of my thoughts. Here are my ten favorite things about travel. My Passport Holder – I was given this magnetic envelope as a going away present from my last job in New York City before I moved to the Caribbean. While I think it is actually a photo holder, it perfect fits my passport, my international driver’s license, and I usually put my boarding pass under the flap as it is magnetic and I am guaranteed not to lose it! My favorite thing about it is the color and the starfish closure. Going to the Airport – This is when the trip starts to feel real to me, and I love going to the airport. The potential lines at check-in and security don’t bother me. Arriving at the airport brings a tingle of excitement to me, and I can’t wait to get my boarding pass. I only wish you didn’t have to arrive so early, as all I want to do is get on the plane and go! 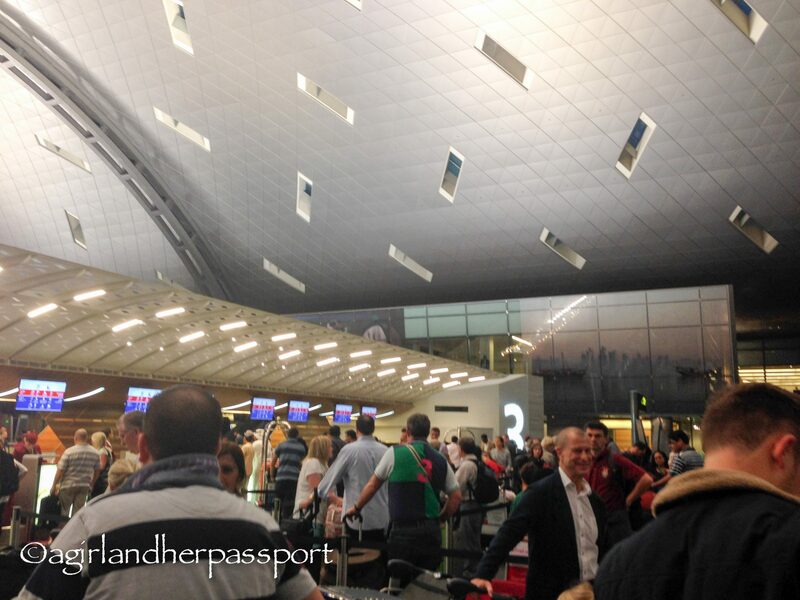 Airport Lounges – Ever since getting status with Qatar Airways, I have grown to love airport lounges. I know this sounds like I am a travel snob, sorry. But I love being able to get away from the noise of the airport. It helps to start your journey off on the right foot, especially if you are going on a long haul flight. 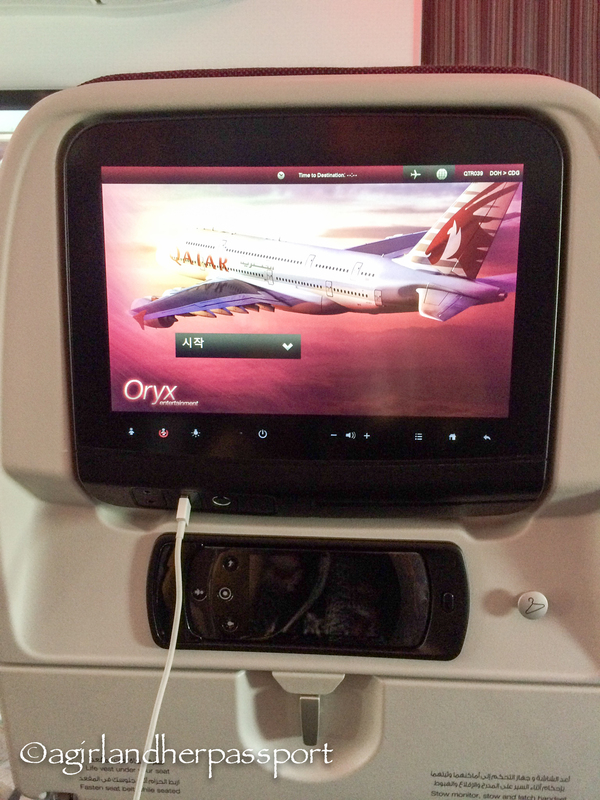 Movies on planes – I have never been to the movies in the over two years I have lived in Qatar for reasons I won’t go into here. So when I get on a plane, I am ready to binge watch as many movies as I can before we get to the next airport. Of course, I do sleep on planes too, but this doesn’t always go as planned, so I watch movies I have seen some great movies that I might not have considered if I had to pay for them. I do have to be careful to stifle the laughs and get a bit embarrassed if I start tearing up at a movie. Hotel beds – What is it about hotels beds?! Almost always, they are more luxurious than your own bed and may be more comfortable depending on your preference. It could also be that every day someone comes in and makes the bed, which I never do at home! Taking photos – The travel bug has bitten down on me and hasn’t let go, but so has the travel photography bug. I love trying to get photos from a different angle. If you ever see me on a trip, I may stand in the same place for 10 minutes trying to get just the right settings for a photo. However, you probably won’t see me with my camera around my neck, as I have a huge fear of my camera getting damaged or stolen. Not because I couldn’t get another camera, but all my photos would be gone! People watching – There is nothing better than sitting in an outdoor cafe and watching people walk by. I sometimes try to guess where they are from. I love seeing them interact with their travel buddies, and usually I can tell whether they are family or friends. I also love to listen to people’s conversations about the food they are eating or the service, if they are speaking English of course. It is always interesting to hear what they are saying and what they do and don’t like. Getting lost – I am not talking lost lost, but not following directions and just walking and seeing where it leads. This is one of the major reasons I love traveling by myself, as I do not have to have a set agenda. 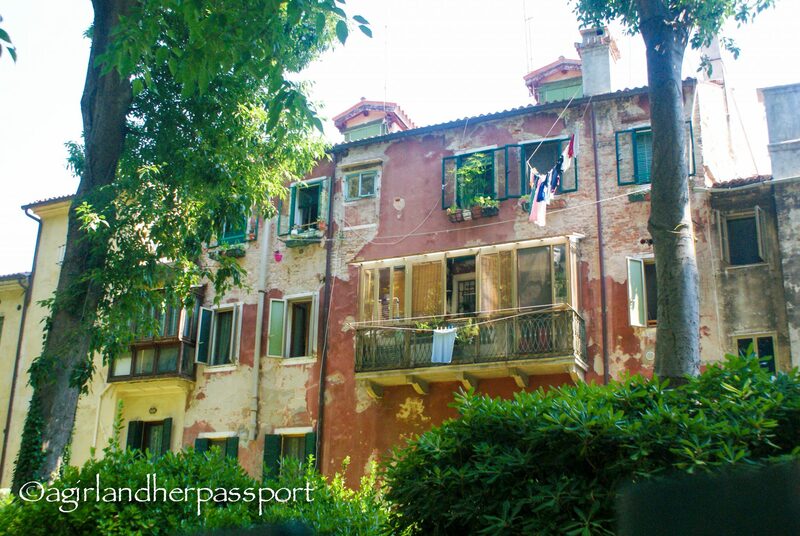 This became very obvious to me when I was in Venice solo. I walk till I get tired and then do a little of #7 or #6 and meander back to where I came from. Museums – I never tire of museums! My biggest disappointed in Paris was that I couldn’t make it to all the museums. There were just too many to see! Seeing another country’s culture through a museum is one of my favorite things. Usually, you get to learn about their past and then go outside and see the present, possibly the future. Beaches – This one doesn’t happen as often as it should! I love beaches, and I love vacations that involve them. I haven’t taken tons of them recently, but I am going to try to do so in the future. My trip to Goa was based solely on the fact that there was a beach involved! I hope you have enjoyed my little indulgence in thinking about my favorite things about travel. 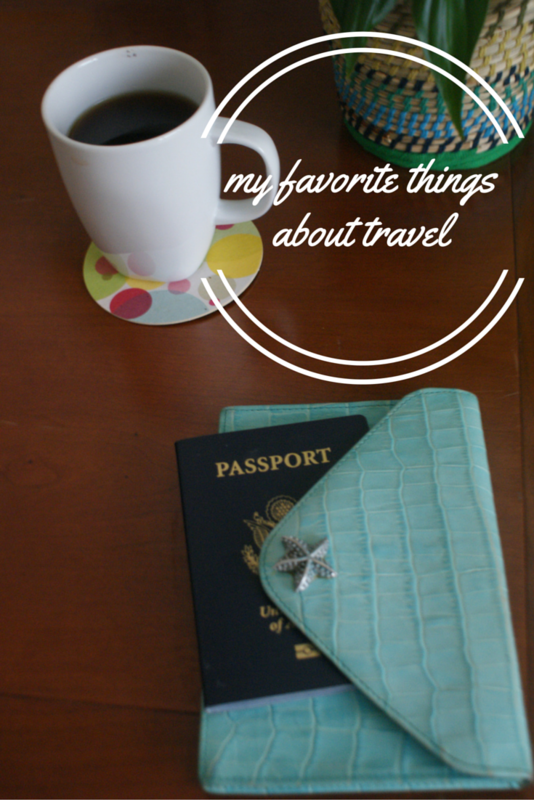 What are some of your favorite things about travel? Tell us in the comments! Be sure to check out the host’s blogs for their favorite things, Kelly, Emma, Rebecca, or Frankie. Also, sorry for the strange fonts, I couldn’t fix it. I love trying new food while traveling too, but definitely not as adventurous as you!! I am glad I am not the only one that enjoys the airport! Thanks for stopping by! Nice list. I love the last four especially. It’s a wonderful feeling wandering around an unfamiliar city, not knowing or caring where you’re going. That’s usually when you create the most surprising and special travel memories. Thanks Clare! I totally agree. Memories are the best souvenirs. OMG Tiff, reference to #5. I though I taught you better – to make your bed!! Haha! Thanks Mom! You know I rarely make my bed. Love you too! That passport holder is too cute! And I totally know what you mean about going to the airport, the butterflies are great. Thank you. I love it. Great, you can armchair travel with me. I would love to have you come along. I think you and I would travel quite well together because I love all of these things about traveling! One of my other favorite things to do when I am traveling is to try a few different coffee shops. I find my favorite and then try to go back as much as possible! Carolann recently posted…A few of my favorite things. Wow! I didn’t think anyone would agree with all my things. Where do you want to go!? I love coffee and coffee shops. Great people watching! My favourite things about travelling seem to change every time I return from a trip almost as if I return as a different person. Oh yes! Travel changes you so much. Oh great list – I agree with so many! Travel anticipation is so much fun. I’m a huge one for taking lots of photos (when I can) and meandering to get a sense of a city. Travel anticipation is one of the best feelings. Thanks for stopping by! Oh I like that idea! Sound fun. Thanks for stopping by! I love looking at my photos, so I can relate. Thanks for the comment Barb! I cant’t travel by plane so my husband and I travel with our car and trailor in the US an Canada. The best part is we can stop whenever we want and just hop on our trailor for the night. And yes I agree taking pictures is great. And looking at them after is magic. As for getting lost well that happens a lot LOL! As always it’s nice to read you. I love that about traveling by car, freedom. Thanks for reading! I agree with you on #2,5,8 & 9 I am like that too haha! You should! There are lots of great family travel blogs that can help you plan and budget. Thanks for stopping by!